The Irish football mogul was grilled by the judge in Marbella for two hours behind closed doors. Arriving in a white Range Rover with two men, it is the first time the football boss has faced the music in Spain. He was joined by his former chief executive Dominic Pickering, Sarah O’Callaghan, and Nicola Shaw, a former director of MRI Ireland. Meanwhile, 90-year-old Fernando Arespacochaga, whose Peruvian company Inmobiliaria Vasco Peruana SAC took over MRI Overseas Property Group in 2010, also travelled over for the hearing. None of the accused, who have continually denied the allegations, would speak with reporters. “I’m sure you are a lovely lady but I am not speaking to you,” said MacAnthony. 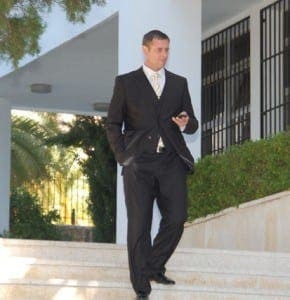 It comes three months after over 40 victims travelled to Marbella to tell a judge how the football boss’ company MacAnthony Realty International (MRI) failed to deliver over half a million euros of furniture to them between 2005 and 2010. MRI – which boasted an annual turnover of more than 100m euros before the crisis – developed resorts in several countries from its main base in Marbella, from where it sold the furniture packs. 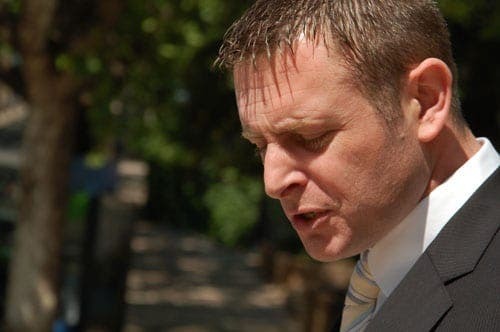 The alleged victims – who filed a claim in Madrid in June last year – accuse MacAnthony, 35, of keeping 600,000 euros which they collectively paid for furniture packages for homes in Bulgaria, Turkey, and Morocco. Meanwhile, Antonio Flores, the Spanish lawyer acting for the group, claims ‘many other’ customers are also affected and due to file further claims. “The missing furniture is just one of the irregularities linked to the company,” he said. Flores insisted an additional claim, totalling 15m euros, is being prepared on behalf of up to 200 British and Irish MRI customers claiming they lost large sums in upfront fees. “Today was just the first step. The courts were gathering information and just listening to what everyone has to say before they decide how to proceed further,” said Flores.